Used to be that things like yoga and acupuncture were considered unconventional, — even downright weird, with no proven benefits. Today, those and other alternative therapies might not quite be mainstream, but they’re regarded as legitimate means of treating or preventing diseases or conditions. As a result, a growing number of places are integrating them into, and alongside, more traditional Western approaches. As the holistic health trend continues to gather steam, options to enable oneself to feel better and attain better health are increasing across the region. That’s true whether it’s dropping a few pounds, increasing energy or flexibility, or revitalizing all aspects of the body and mind. At the Holistic Spa in Gaylord, practitioners offer everything from acupuncture, ionic foot detox, even sound therapy. Owner Linda Durant, who specializes in aromatherapy, massage therapy, and ionic foot detox, said they all work in different ways to purge the body of toxins. For example, the ionic foot detoxification finds people relaxing while their feet are soaking in warm water with a gentle electric current running through it. It’s puported to enable the ions in the water to pull out oppositely charged toxins through the pores in the feet. Then there’s soundtherapy, which Durant said was something new even to her. 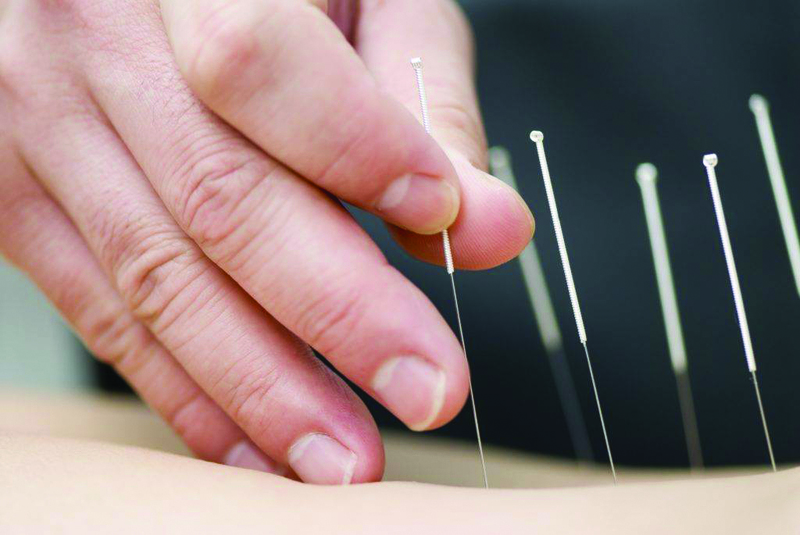 “It’s much like acupuncture — it gets stagnant energy flowing again,” she said. The thinking behind it is that natural frequencies the body produces can be disrupted by anxiety or illness. Durant said sound therapist Kayla Jo Cross uses things like tuning forks of different pitches, Tibetan bowls, and Tibetan finger cymbals to “retune” the body.The different vibrations, frequencies, tones, and sounds relax the patient, putting them into a meditative state. “OB-GYN’s use it with their patients who are overdue,” said Durant. Other places are combining treatmentsand nutrition, like at Table Health in Traverse City and Nourish in Cheboygan. Osteopathic physician Amelia Bueche at Table Health said an approach that incorporates multiple levels of care is bound to be more beneficial. The clinic offers nutritional expertise and a healthy food market, as well as osteopathic manipulation, massage therapy, and guided exercise and cross-training services. Nourish goes one better, with a restaurant as well as a market and a movement studio. “It’s a wellness collaborative. You can come in three different doors: the market, movement, or eatery,” said Emily Eckhart, who founded the collaborative health studio with Christy Stempky. The movement studio hosts yoga classes, fitness classes, and wellness-based workshops; the market offers dry goods, locally sourced foods and other Michigan-made goods; and the eatery offers a variety of breakfast and lunch options, all gluten-free, with dairy-free, nut-free, and vegan options daily. Ingredients like veggies, eggs, oatmeal, and oat-based waffles, black bean burgers, and brown rice come together in various permutations. All these places and the people who work at them are looking to provide health services that not only treat afflictions of various sorts but also forestall them. Seems Benjamin Franklin wasn’t wrong: An ounce of prevention is worth a pound of cure. Little matter that Franklin was referring to fire safety, as the adage has today been mostly usurped to focus on health. Katie Winnell, a board-certified nurse coachand clinical meditation specialist who practices in Petoskey, said although she practices under the American Holistic Nurses Association, she prefers the term “integrative health” to “holistic” or “alternative.” That’s because she sees the key to healthy living as combining various facets, such as healthy eating, clinical meditation, lifestyle modification, andbehavioral change. Winnell said such practices can address even chronic diseases. The Centers for Disease Control note that six in ten adults have a chronic disease, while four in ten have two or more. Winnell, who began her career as an oncology nurse, saw that addressing more aspects of one’s health provided a means to combat and control those chronic diseases. While she looks to combine nutrition, exercise, and spiritual and emotional health, she said those she is working with have to be committed as well. “The key is the need to want to be healthy. Most health problems stem from behavioral choices,” she said. “It’s a process,” she continued. “Long-term change is not an easy fix.” Winnell said people have to be willing to adapt and use the information and tools she can provide. That includes healthy eating and weight management as well as lifestyle and behavioral changes.She said meditation is often used — and even recommended — by physicians to reduce symptoms of high blood pressure, heart disease, and gastrointestinal diseases, such as irritable bowel syndrome and ulcerative colitis, as well as chronic pain and other chronic illnesses. Or to any one way of providing treatment. Table Health offers community memberships and subscriptions, which can include date nights, dinners, and other events. Nourish offers a complete calendar of yoga and reiki (aka healing touch) classes, a restaurant open Tuesday through Saturday, and the market, which is open seven days a week. Jovia Wellness in Traverse City also brings together various disciplines and treatments, from chiropractic to massage, life- and energy-coaching, qigong, psychotherapy, yoga, even dance. It offers private sessions, group classes, life-enriching events and workshops, too. Dr. Heather Rassel co-founded Jovia with business partner and fellow healer and life coach, Cathy Colburn, last June. She said she came up with the idea of combining her chiropractic practice with practitioners offering complementary therapies after emerging from a meditative state. Now Jovia offers everything from chiropractic to massage therapy, aromatherapy, qigong, chakradance, psychotherapy and more. “People started contacting me, and I started running into people. We have experts in the mind, body, spirit fields. It’s been evolving and will continue to be,” she said. One new addition: a dance class for pregnant women or those who have recently given birth. The concept of combining accepted therapies, such as nutrition or osteopathic or chiropractic manipulation, alongside more esoteric offerings, such as sound therapy or chakra-dance, seems to be working. Those in the industry are hopeful that trend will continue. “There is room for growth in northern Michigan especially,” said Nourish’s Stempel. She believes there are opportunities for more such endeavors. A longtime gardener who grew up on a farm, one area she sees potential in working directly with farms and farmers. While the therapies are increasingly becoming accepted in the mainstream, insurance companies are often reluctant to pay for such services. As a result, many of these clinics and facilities do not accept insurance at all; rather, they encourage patrons to reach out directly to their health insurers to determine if any portion of their treatments may be covered.